Wheelchair access: Fair, paved path to the island is a little steep. Parking: Fair, only 4 spots on the street. Comments: Simley Lake is a very popular fishing lake. It has a pier, shore fishing stations on the north shore and island, plus a lot of open space to fish from. A shoreline restoration project was conducted in 2009 and expanded in 2010. Large Bluegills are stocked in the fall and it is stocked with Walleye fingerlings as well. In 2009, a scout project was conducted to install fish nesting structures that will hopefully be used by Smallmouth Bass and result in a larger population in a few years. Channel Catfish fingerlings (8"-10") were stocked for the first time in 2012 and again in 2013. 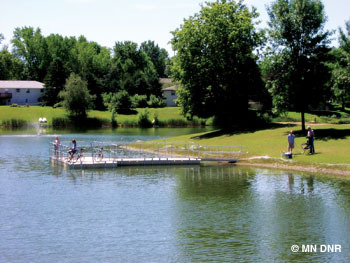 The FiN staff along with the City of Inver Grove Heights is conducting a Common Carp removal project on Simley Pond in an attempt to improve water quality. There does not appear to be successful spawning of Common Carp in Simley and through the removal of adult fish it may be possible to improve water quality. In 2013 there were 110 carp removed with an average weight of 5.5 pounds. More fish will be removed in the spring of 2014 and water quality will be monitored to identify any improvements. Additionally, many juvenile Largemouth Bass were observed as well as some juvenile Smallmouth Bass. Numerous Channel Catfish and Walleye were seen during the carp harvest. NOTICE: A winterkill has occurred on Simley Pond in 2014. This is a rare event for this pond, but the long winter with heavy snow on the ice has caused fish kills in many lakes and ponds that normally do not experience a winterkill. Many species of gamefish were observed during a reconnaissance of the pond on April 18th as well as hundreds of Common Carp.